Until late yesterday afternoon, I was convinced that you had discovered Obama's original Kenyan birth certificate. Heck, I bought it completely. I had to...I had to believe it--that's what having faith is all about. It did not matter that it was issued by the Republic of Kenya a year before that nation existed. That's easily explained by time travel. Hugo Chavez developed it a few years ago and used it to to clean up the Clintons' murders of Vince Foster, Liberace, and 763 people in Mena, Arkansas. Apparently, he also conspired with Obama to change African history as well. Anyway, like I said, I believed your document to be absolutely genuine up until the moment, yesterday afternoon, when a one-armed man showed me an even more genuine birth certificate in a Nashville area Waffle House. I was skeptical at first. It didn't look like any government document I'd ever seen. But then the man explained that it was an alien (not the kind of alien Lou Dobbs says gives us the leprosy--the other ones; the ones from space) document. He said that Obama's mother was actually a reptillian alien from Szlzrd Star System. Then he went on to translate the document, and it all made sense. You see, it was signed by George Soros. That's what convinced me. It's just the kind of thing Soros would do. He's like that. I have to believe that. It's a matter of faith. Here's a photo of the document. I've annotated it with the translation. I'd like to get this to you. Where can I send it? p.s. I saw your appearance on MSNBC. You were spectacular. You should do more interviews, and you should get your supporter, Rep. Michele Bachmann, to join you. Imagine my disappointment when someone pulled off her wig, and it was Patrick Swayze reprising his role in 'To Wong Foo, Thanks for Everything, Julie Newmar'. More sacred iconography just flushed down the goddamned toilet. I'm finishing my vodka and going to bed. Thanks to you, dear General, I have seen the light. It all makes sense now. No wonder Obama won't produce his birth certificate. If he did, he would have to admit that he stole that hubcap. When I hear her name, I think of ORLY Owl. That Secret Agent feller at the Waffle House? He didn't introduce himself as "Bond, JoeBob Bond." did he, Sir? The reason I ask, Sir, is that JoeBob B. and me, we go back some considerable ways together. He was just a freshman in HS (of course he was really 207 years old at the time) when he helped cover-up the "second man on the grassy knoll" thing, back in Dallas. Then he and I both worked on faking up that moon landing (they shot most of the footage for allathem on the first go, then just "shopped" in the other astronauts, later). Anyways, Sir, all I'm sayin' is watch your back--and your wallet. I thought I was gonna have to break some bad news to you, Sir; about that "birth certificate", cuz, well, it's a Toyota hubcap. But then, I had oneathem epifannies. I remembered that Toyota's logo is also the family crest of the Slzrdian Royal Family. If you look closely you can see where "Toyota" started it's takeover. It was post WWII Japan, while the place was in a shambles. So, first they took over Nipland then they came here about 15 or so years ago and started opening plants all over OUR hemidemisemisphere. They got plants in Alabama, Indiana, Kentucky, Mississippi, Texas and West Virginia PLUS plants in Canuckistan and Mexicoistan. It's been child's play for Hugo Chavez to sneak Vogon Battle Cruisers in and out of this country by disguising them as a Toyota Priapus. So, Sir, I hate to say it, but we got bigger fish to spoil the broth with than worryin' about whether that ditz Oily Taint gets her moment of being a mini celebrity. Oh, yeah, I almost forgot, Kato Kaolin is oneathem, too. I mean, you're right, but not for the reasons you think you are, Sir. BTW, you know what I said about watching your wallet? Well, just in case you notice that your Amex Black is missing, don't worry about that one, it's on a secret mission. You've helped to set back mascara sales for the next 10 years. How can you call yourself a good American for having helped to set back the economic recovery in such a manner? More sacred iconography just flushed down the goddamned toilet. I'm finishing my vodka and going to bed." OhMaaaaan, I kept thinking I had seen her somewhere else... You hit the nail on the head with that comment but now my 20 year affection for Patrick Swayze has been 'tainted'. I'm opening a St. Pauli Girl to dull the pain: it will take more than one. Damn fine eye you have there jcricket, damn fine. The thing about Slzrd -- no bowling balls. Just like Kryptonite to them. No matter how long they live in our atmosphere, they always give themselves away with the bowling. With people like this crowing about Obama's Birth certificate I think it is fair summation that they just got laughed straight off of the planet . How many times are we going to fall for Sacha Baron Cohen's crap? We put the gull in gullible. p.s. 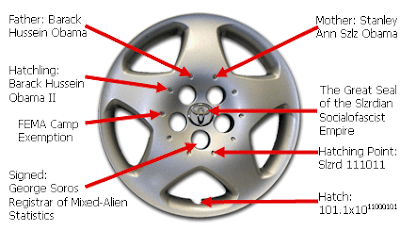 I know where you got that hubcap from. I knew he was an illegal alien! In honor of Pres. Obama’s birthday, everybody’s favorite Hawaiian-ex-pats-from-Chicago, Poi Dog Pondering: “Complicated” … it’s all right. When they make the movie about Orly, I see Francis McDormand in the title role in "Orly's Ordeal". You, too, can be a swarthy Kenyan. Get your Kenyan birth certificate here.